It’s all about science today, after cloning Dolly, scientists have now reached a breakthrough with successfully cloning monkey embryos. This means great news for stem cell research. 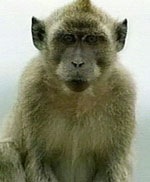 The embryos donor, Semos was a nine-year-old rhesus macaque, who is named after the ape overlord in Planet of the Apes. The irony. This entry was posted on Friday, November 16th, 2007 at 9:10 pm	and is filed under Science. You can follow any responses to this entry through the RSS 2.0 feed. You can skip to the end and leave a response. Pinging is currently not allowed.